There are scores of angling books that aren’t necessarily really about fishing, but that draw meaning from the experiences, thoughts, and observations that are peripheral to, though inseparable from, the act of fishing. The Old Man and the Sea may come to mind—its draw, such as it is, doesn’t come from the protagonist’s angling savvy or tactical expertise, but rather from the experiences that threaten or thrill him, the power of the ocean around him, and his drive to go out and catch something in the first place. Writings that orbit the act of fishing, skipping the practical and technical aspects of the thing, can sometimes shed light on why we fish in the first place. The best among those works* convey the dynamics—gravity, awe, frustration, skill, ineptitude, etc. etc.—that all anglers are (or will become) familiar with. Blood Knots is part of that tradition. Luke Jennings, who was born in England through no fault of his own, pretty well nails the angler’s machinations, tics, and peculiar urgencies. He does so with good humor (or I guess “humour”) and without any apparent effort. He’s the kind of writer who makes other writers seethe, enviously. Jennings has no specific intent to instruct, and that may be one reason Blood Knots so resonates. Jennings has the inborn streak of dereliction that all honest anglers share: a trespasser’s heart (see his first few pages about fishing a London canal) and a crafty child’s knack for evading responsibility (“I glanced at my watch. It was well past the time I was supposed to be back at the house for supper, yet something made me stay.”). There’s also a bit of the supernatural. For example, I bet that Aleister Crowley has never appeared in a fishing book, before or since, but there’s an interesting mention of him here. Jennings follows this up with a warm and considered discussion on the similarities between a Catholic and a dry-fly man. (Self-abnegation, constancy, and stubborn faith being the keys.) Detours like these are what make this so much more than a fishing book. The flonker stands in the middle of a circle of occupants holding a driveller, at the end of which is an ale-soaked dwile. Turning counter-sunwise as the rest go sunwise, he flonks his dwile. A hit wins the flonker a point, but in the event of a swadger, he has to drink the pot. The roach apparently is the “most beautiful of freshwater fish.” I’m not inclined to look it up, but no one who’s seen a wild brookie could ever have made that claim. While fighting a mighty fish, Jennings’s “rod kicked in my hands, but that first breakneck dash was the only shot he had in his locker.” Very soon, our Santiago was unhooking his powerful specimen – “a dark-barred half-pounder.” A perch. Jennings is a superb writer, and these examples are in the spirit of good fun. 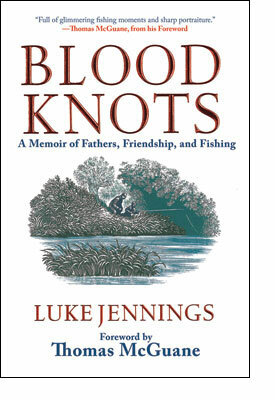 Truth is, Blood Knots is a well-crafted memoir loaded with interesting, intertwined stories and gripping parables. It contains dramatic World War II tales, stories of relationships gained and lost, family bonds cemented, opportunities missed. There are heart-wrenching stories; there are humorous ones. My favorite of the latter is Jennings describing to his friend an angler’s natural progression: first, the angler wants to catch any fish; then just big fish; and finally just quality fish. To which Jennings’s friend, a rock guitarist, responds, “It’s like with women, then?” Nigel Tufnel couldn’t have said it better. MidCurrent devotees may want to know that there’s no fly-fishing until about page 130. This in no way detracts from the book’s virtues; just be aware that if you object to piking with dead bait this book might be a bit of a slog. Regardless, this book will endure. It’s a rare piece of work. If you’re at all interested in angling as literature, you need to get this. Just beware the swadger. Buy Blood Knots in the MidCurrent Store. * Which in my objective opinion are Tom McGuane’s The Longest Silence, Ted Leeson’s The Habit of Rivers, and Viscount Grey of Fallodon’s intro to his book Fly Fishing.